The Dr. 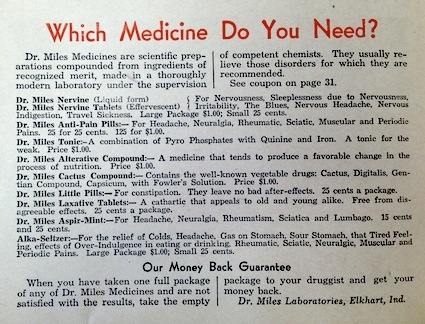 Miles Medical Company in Elkhart, Indiana, made a fortune selling the Dr. Miles’ Nervine, a patent medicine that calmed the nerves. Like most patent medicine companies, Dr. Miles marketed its medicines through pamphlets and almanacs. And like most patent medicines, Dr. Miles’ Nervine seemed to cure any ailment and to improve your general well being. Every pamphlet was filled with testimonial from reputable and satisfied patient-customers (we should probably hear echoes of this technique in today’s DTC pharmaceutical campaigns). Dr. Miles occupies an interesting place in the history of patent medicines. Unlike other companies that died out with the patent medicine craze, Dr. Miles stumbled onto a compound that we still use today: Alka-Selzer. In the early 1930s Dr. Miles published a pamphlet celebrating its new discovery: Modern Science Discovers a Common Sense Way to Relieve Everyday Aches and Pains . Dr. 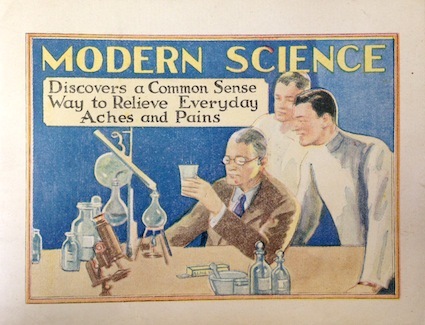 Miles emphasizes the “Modern Science” in marketing their Alka-Seltzer. A postcard glued into this pamphlet suggests that it dates from June 1932, not long after a chemist at the company had developed the product. Gone are the references to astrology so common in patent medicine marketing—about this same time Dr. Miles had published a similar pamphlet that was built around astrology: Character Readings According to the Solar Zodiac (see this post). Dr. Miles’s latest pamphlet focuses instead on the science, the scientists, and the scientific apparatus: flasks and jars, microscope, distillation apparatus, clean-cut, staid men in white lab coats. A staid, clean-cut scientist inspects a glass of Alka-Seltzer. In 1932 Alka-Seltzer took its place alongside Dr. Miles’ many other patent medicines: Nervine, Nervine Tablets, Anti-Pain pills, a tonic, an “Alterative Compound,” a Cactus Compound, Little Pills, Laxative Tablets, and Aspir-Mint. 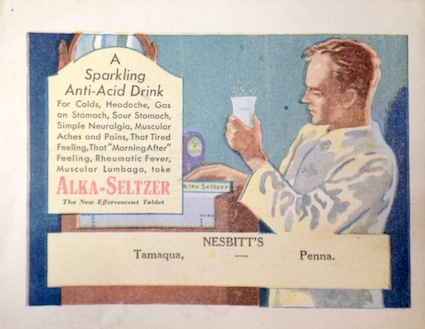 In 1932 Alka-Seltzer was just one of many patent medicines sold by Dr. Miles. Today Alka-Seltzer as well as the former Dr. Miles company are owned by Bayer Schering Pharma, perhaps best known for its aspirin (Bayer also gave us Heroin, which it originally marketed as a cough medicine).